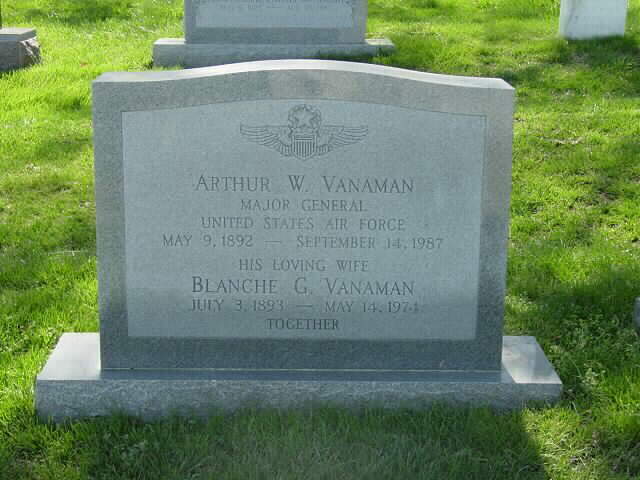 Arthur William Vanaman was born in Millville, New Jersey, in l892. He graduated from Drexel Institute of Technology with a bachelor of science degree in electrical engineering in 19l5 and received an honorary doctor of science degree from Drexel in June 1942. After graduation (l915-l6) he did postgraduate work at the Postgraduate School of the Westinghouse Electric Company. Enlisting in the Aviation Section of the Signal Enlisted Reserve Corps, General Vanaman completed flying school and on December 22, 1917, was commissioned a first lieutenant in the Signal Officers reserve Corps. He took the advanced aeronautical engineering course at the Massachusetts Institute of Technology in 1918. On July 1, 1920, he was commissioned a First Lieutenant in the Air Service, Regular Army. During his early career in the Air Corps he specialized in engineering assignments. Going to Air Service Command headquarters at Dayton, Ohio, in 1930, General Vanaman became chief of Procurement Engineering and assistant chief of Procurement for the Air Corps. He graduated from the Air Corps Engineering School in 1930, the Air Corps Tactical School in 1935, the Army Industrial College in 1936 and the Army War College in 1937. Appointed assistant air attache in Berlin, Germany, General Vanaman moved to Air Corps headquarters at Washington, D.C., as secretary of the Air Staff in August 1941. The following March General Vanaman was named commanding general of the Air Corps Materiel Center at Wright Field, Dayton, Ohio. In April 1943 he was appointed commanding general of the Oklahoma City Air Service Command at Tinker Field, Oklahoma, and the following March assumed command of the San Antonio Air Service Command at Kelly Field, Texas. In May 1944 General Vanaman went to Eighth Air Corps headquarters in England as assistant chief of staff for intelligence. Shot down over German territory in June 1944, he was captured and remained a prisoner of war for a year. Joining the Air Technical Service Command in June 1945, General Vanaman assumed command of the Mobile ATSC at Brookley Field, Alabama, and became Commanding General of the Sacramento ATSC at McClellan Field, California, the following January. He was designated Commandant of the Industrial College of the Armed Forces at Fort McNair, Washington, D.C., in April 1948, and in June 1952 returned to McClellan Air Force Base, California, as commanding general of the Sacramento Air Materiel Area, Air Materiel Command. His decorations include the Distinguished Service Medal, Legion of Merit with two oak leaf clusters, Bronze Star Medal and the Belgian Croix de Guerre with Palms.